If you own an apartment building, or you’re responsible for the maintenance of the grounds and the building, you probably have dozens of things to attend to everyday. While many of them are the standard, day-to-day concerns, some larger projects can go for a long time before you get to them because of how busy you are. 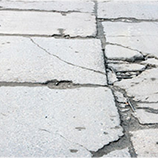 If you’ve noticed that some of the concrete around your building, whether it’s the sidewalks, patios, or driveways, have started to sink, crack, or jut up, you should take care of that as soon as possible. Early concrete repair can save you a ton of time, money, headaches, and even legal liability! 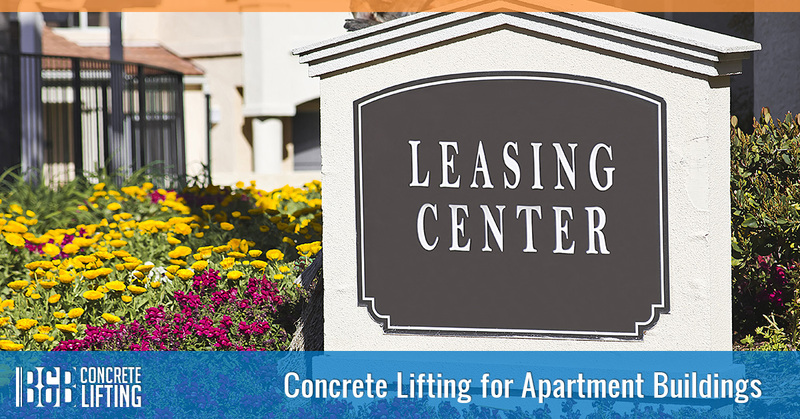 Call us at B & B Concrete Lifting in Chicago today so we can schedule a time to come to your apartment building and take a look at the concrete slabs that you have concerns about. 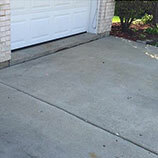 We will provide you with an estimate, and then schedule a time to repair your concrete. Read on to find out how we evaluate your concrete, how our process works, and how you save money when you choose concrete lifting over concrete replacement. Our process for determining whether or not your concrete can be repaired is fairly simple but it also takes into account subtleties that may not be easy to see to the untrained eye. The first part of the process is simple: we look at the concrete to see if it is sinking or if the slab is tilting one way or another. If it is, this is usually a pretty good indicator that we can use concrete lifting to restore your slabs to their proper positions. However, if the concrete slab has been sinking for too long and lots of cracks (including large splits) have appeared, it may not be possible to save all of the slab. If your slab is crumbling in one or more areas it can also make concrete lifting more difficult, unless that crumbling is just on the very top of the slab’s surface. When you call B & B Concrete Lifting for concrete repair, we use a process called concrete lifting (some people call it mudjacking) to lift your concrete slabs back to where they should be. Simply put, concrete lifting requires drilling a small hole through a concrete slab and pumping a special mix of materials into the space underneath it. This lifts the concrete back up to its original position. Why does concrete start to sink in the first place? There are two main causes: compaction and erosion. When the soil under your concrete is washed away bit by bit due to improper leveling before the slabs were poured or due to drainage issues, this is called erosion. If the area where a slab was poured wasn’t levelled the right way, the weight of concrete, along with the added weight of vehicles, can compact the soil together which allows the slab to sink in that direction. If you want to read more about what causes concrete to sink, check out this blog entry. While it’s very rare for either erosion or compaction to happen quickly, it’s very common for these factors to take such a long time to become apparent that you might never notice them until a crack has formed or you or one of your tenants has tripped over a jutting slab. 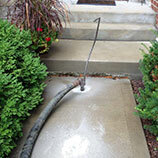 Concrete lifting is one of the most affordable forms of concrete repair. In addition to being affordable, there is much less down-time and there’s almost zero mess. While re-pouring a concrete slab might seem like the best way to ensure that you won’t have to deal with sinking concrete again, that just isn’t true. Re-pouring a slab is much more expensive than concrete lifting and it won’t necessarily fix any of the issues that allowed your concrete to sink in the first place. If the area isn’t properly leveled and drainage issues aren’t addressed, your apartment building will be in the exact same spot again. The material we use for concrete repair resists further erosion and compaction so you definitely won’t see the problem repeat itself. We break down the differences between concrete lifting and slab re-pouring in more depth in this entry. 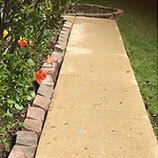 Contact us today to find out how our concrete repair services can improve not just the look of your concrete slabs but the length of time they’ll last, too. We’re Chicago’s premier concrete lifting business because we work fast, clean, and quick thanks to our many years of experience. Protect yourself from any possible legal issues that could arise from concrete that needs to be repaired, as well as saving yourself from the high costs of pouring all new concrete slabs by getting in touch with us as soon as possible. The summertime is the perfect season to have your concrete repaired, so call us before we get too busy.